Public concerns that anti-terrorism policies have gone too far in restricting civil liberties have fallen to their lowest level in five years (28%); twice as many (56%) now say their greater concern is that these policies have not gone far enough to adequately protect the country. However, Americans are not much more likely today to support the use of U.S. ground forces against ISIS than they were before the recent terror attacks. Currently, 47% favor the use of U.S. ground forces against ISIS, little changed from July (44%). 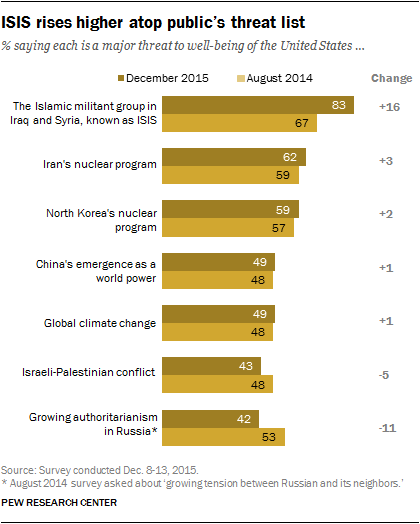 And overall concerns about the rise of Islamic extremism at home and abroad, while high, are no higher than they were in September 2014. Perceptions about the relationship between Islam and violence also have not changed significantly since last year – though these opinions, already politically polarized, have become even more so. Currently, 46% say the Islamic religion is more likely than others to encourage violence among its believers; about as many (45%) say the Islamic religion does not encourage violence more than other religions. About two-thirds (68%) of Republicans say Islam is more likely to encourage violence, little changed from September 2014 (67%), but the highest share saying this on a question that dates to 2002. In contrast, the share of Democrats associating Islam with violence has declined 12 percentage points since last year, from 42% to 30%. In general, the public rejects by a wide margin the idea of holding U.S. Muslims to increased scrutiny because of their religion. About six-in-ten Americans (61%) say Muslims living in the United States should not be subject to additional scrutiny solely because of their religion; 32% say Muslims should be subject to more scrutiny than people in other religious groups. Conservative Republicans are the only major ideological, demographic or religious group in which a majority (57%) says Muslims in this country should be subject to greater scrutiny than those in other religious groups. Majorities of moderate and liberal Republicans (59%), independents (62%), conservative and moderate Democrats (67%), and liberal Democrats (87%) say Muslims should not receive greater scrutiny solely because of their religion. The survey finds that, as has been the case since 2002, the Republican Party has a sizable advantage over the Democrats on terrorism: 46% of the public says the Republican Party can do better in dealing with the terrorist threat at home, compared with 34% who favor the Democrats. Republicans hold a narrower, six-point edge (43% to 37%) as the party better able to reflect people’s views about gun control. The GOP had an even wider lead on this issue in July (48% to 36%). 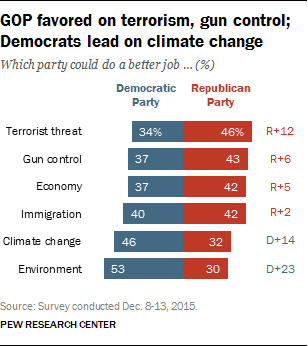 Neither party has a significant advantage on the economy or immigration, while the Democratic Party holds wide leads over the GOP on both climate change (46% to 32%) and the environment (53% to 30%). Americans are divided about whether they see Islam as more likely than other religions to encourage violence among its believers: 46% say it is more likely, while 45% say it is not more likely. The share of the public saying that Islam is more likely than other religions to encourage violence has dropped four percentage points since a historical high of 50% in September 2014. For much of the past decade, public views on this measure have been closely divided. 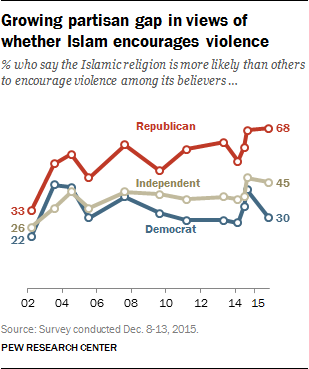 The partisan divide over whether Islam encourages violence is now as wide as it has ever been. 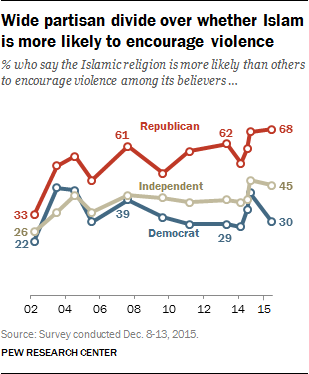 Fully 68% of Republicans say Islam encourages violence more than other religions, a historical high but little changed since last fall. By contrast, just 30% of Democrats say Islam is more likely to encourage violence than other religions, down from 42% in September 2014, but on par with Democratic opinion at other points in recent years. Independents remain split over this question: 45% say Islam is more likely to encourage violence than other religions, while the same proportion (45%) say it is not. Ideological divides are even starker, and growing: About three-quarters (77%) of conservative Republicans say that Islam is more likely to encourage violence than other religions (just 16% say it does not). Liberal Democratic opinion is nearly the inverse: 73% of liberal Democrats say Islam is no more likely than other religions to encourage violence, while 21% believe that it does. The share of liberals saying Islam is more likely to encourage violence is down 14-points since the fall of 2014. Just 32% of those ages 18 to 29 say Islam encourages violence to a greater degree than other faiths, compared with roughly half of those in other age groups. But the age gap in these views is narrower than it was last fall. Today, 51% of Americans 65 and older say Islam is more likely than other religions to encourage violence; last September, 64% said this. The view that Islam is more violent than other religions is more likely to be held by less educated Americans: 51% of those who have not attended college say this, compared with 40% of those with college degrees and just 35% of those with postgraduate degrees. Racial divides over these views persist. While only 30% of blacks and 40% of Hispanics say Islam is more likely than other religions to encourage violence, half of whites (50%) say this. Seven-in-ten white evangelical Protestants say Islam encourages violence more than other religions, the highest percentage of any religious group and little changed from 2014. By comparison, about half of Catholics (49%) and white mainline Protestants (51%) say this. 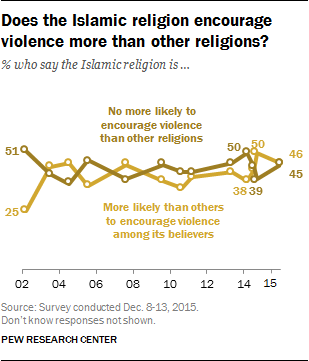 And among the religiously unaffiliated, just 35% say Islam is more likely to encourage violence among its believers. About six-in-ten (61%) Americans say that there should not be additional scrutiny of Muslims living in the U.S. solely based on their religion as a part of the federal government’s efforts to prevent terrorism. About a third (32%) say Muslims should be subject to greater scrutiny than people in other religious groups. There are wide partisan and ideological divisions on this question. Republicans are roughly evenly divided (49% greater scrutiny, 44% no additional scrutiny), while clear majorities of independents (62%) and Democrats (76%) say U.S. Muslims should not be subject to greater scrutiny because of their religion. Conservative Republicans, in particular, stand apart from other groups as the sole partisan or ideological group in which a majority supports greater scrutiny of Muslims because of their religion: 57% say this, while just 35% say Muslims should not be subject to more attention. In contrast, 59% of moderate and liberal Republicans say they do not think Muslims should be subject to additional scrutiny; about a third (35%) say they should. Liberal Democrats are particularly likely to reject the idea of subjecting Muslims living in the U.S. to closer examination than people of other faiths: 87% say Muslims should not be subject to greater scrutiny than those in other groups, while just 12% say they should. And by greater than two-to-one (67% to 27%), more conservative and moderate Democrats say Muslims should not be scrutinized more than others than say they should. Eight-in-ten (80%) young adults (those 18-29) say scrutiny of U.S. Muslims solely because of their religion should not be a part of the federal government’s efforts to prevent terrorism. And by about two-to-one (63% vs. 30%), those 30 to 49 years old also say this. Views are more divided among those ages 50 and older: half (50%) say Muslims living in the U.S. should be subject to more scrutiny than people in other religious groups, while 41% say they should not be subject to additional scrutiny. Non-whites are more likely than whites to reject the idea of scrutiny of Muslims based on religion: 74% of blacks, along with 66% of Hispanics say Muslims living in the U.S. should not face greater scrutiny solely because of their faith, compared with a narrower majority (57%) of whites. Nearly seven-in-ten postgraduates (69%) and 65% of college graduates say Muslims should not be subject to greater scrutiny. Those without a college degree are somewhat more likely to say Muslims should face more scrutiny because of their religion (34% say this, while 59% say they should not). Majorities of those in most religious groups say Muslims should not face any more scrutiny as a result of their religion. White evangelicals are an exception, and are divided: 50% say Muslims living in the U.S. should be subject to more scrutiny, 43% say they should not. Nearly three-in-ten (29%) Americans cite terrorism (18%), national security (8%) or ISIS (7%) as the most important problem facing the country today. One year ago, just 4% of the public cited any of these issues. 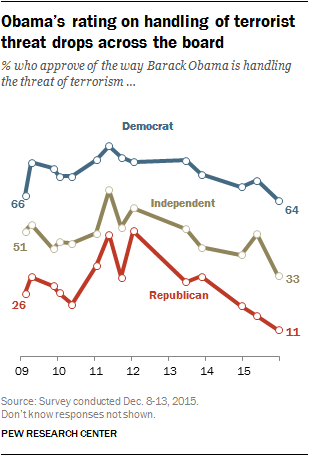 The share citing terrorism is the highest it has been since February 2003. In the wake of multiple high-profile mass shootings around the country, 5% of Americans now mention gun control (4%) or mass shootings (2%) as the most important problem today. A year ago, 1% mentioned this as the most important problem. There are wide partisan divides on the most important problem facing the nation. Four-in-ten (41%) Republicans mention terrorism, defense issues and national security or ISIS, while fewer independents (28%) and Democrats (23%) cite these issues. Additionally, Republicans more commonly mention immigration as the most important problem (14%) than do independents (7%) or Democrats (3%). Democrats are more likely than Republicans to cite partisan gridlock and division in the country (8% of Democrats vs. 2% of Republicans). Americans’ ratings of the government’s efforts to reduce the threat of terrorism are now lower than at any point since the September 2001 terrorist attacks. For the first time, more now say the government is doing not too well or not at all well in reducing the threat of terrorism (52%) than say the government is doing either very or fairly well (46%). Positive ratings have fallen 26 points since January (when 72% said very/fairly well). Compared to early 2015, assessments of government efforts to combat terrorism are more negative across the political spectrum. Democrats are now the only partisan group in which a majority (64%) say the government is doing at least fairly well (down from 85% in January). Independents’ positive ratings have dropped 25 points, from 69% to 44%. And just 27% of Republicans now say the government is doing very or fairly well reducing the terrorist threat, down from 63% at the beginning of the year. The views of conservative Republicans, in particular, have turned sharply critical: In January, 59% said the government was doing very well or fairly well; today, only 18% say this. Older and less educated Americans are somewhat more likely than younger and more highly educated Americans to give the government low marks for the job it is doing reducing the threat of terrorism. Among those 50 and older, a majority (57%) say the government is not doing well reducing the terrorist threat (42% say that it is). In contrast, 46% of younger adults (those 18-29 years old) give the government’s performance a negative rating, while 53% say it is doing very or fairly well. Evaluations of the government’s job reducing the threat of terrorism are more positive among and those with a postgraduate degree than among other educational groups: 58% say the government is doing very or fairly well, while 40% say it is doing not too or not at all well. By comparison, 48% of those with a bachelor’s degree, and 44% of those with less education, rate the government’s performance positively. By two-to-one, Americans now say that they are more concerned that the government’s anti-terror policies have not gone far enough to protect the country (56%), rather than that these policies have gone too far in restricting the average person’s civil liberties (28%). Since the start of the year, there has been a seven percentage-point rise in the share expressing concern that these policies have not gone far enough. Concern over government restrictions on civil liberties has fallen dramatically since July 2013, following Edward Snowden’s leaked details about NSA surveillance programs. At that time, more expressed concern that government policies had gone too far restricting civil liberties (47%) than that they did not go far enough to protect the country (35%). The share expressing greater concern that policies do not go far enough to protect the country is now roughly the same as the historical high seen in early 2010, shortly after the failed Christmas-Day terrorist attack on an airliner en route to Detroit (when 58% said policies did not go far enough). Both Republicans and Democrats have become more likely to say that the government’s anti-terrorism policies do not go far enough to protect the country (rather than that they have gone too far restricting civil liberties) since Snowden’s disclosures in 2013. But the shift has been more pronounced among Republicans. 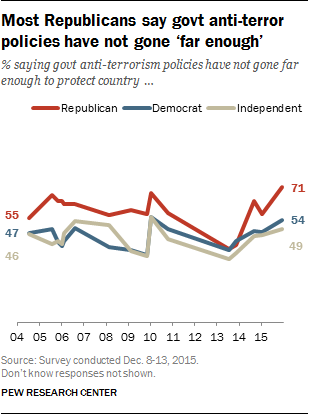 Slightly more than seven-in-ten Republicans (71%) now say their greater concern is that anti-terrorism policies do not go far enough, up 14 points since January (57%) and 33 points since July 2013 (38%). A narrower majority of Democrats (54%) now say their greater concern is that government policies do not go far enough, up somewhat since January and 16 points since 2013. Today, similar proportions of conservative Republicans (71%), moderate and liberal Republicans (74%) and conservative and moderate Democrats (67%) say their greater concern is that anti-terrorism policies have not gone far enough. By contrast, equal shares of liberal Democrats say their greater concern is that policies have gone too far in restricting average people’s civil liberties as say they worry more that these policies have not gone far enough to protect the country (41% each). Adults under 30 are split between concerns that U.S. policies place too many restrictions on civil liberties (43%) and that they do not go far enough to protect the country (44%). 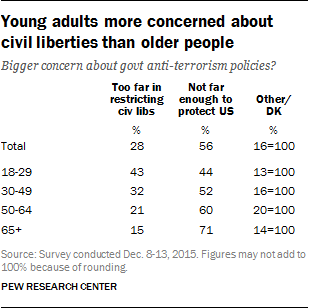 Majorities in every other age group are more concerned about security than civil liberties, though this concern is more pronounced among those 65 and older (71% say this) than those 30-49 (52%) or 50-64 (60%). ISIS ranks high as the top global threat to U.S. The Islamic militant group known as ISIS has risen higher atop the public’s list of global threats to the U.S. Overall, 83% say ISIS is a major threat to the well-being of the United States, while 13% say it is a minor threat and just 3% say it is not a threat. Since August 2014, the public has become 16 points more likely to view ISIS as a major threat to the U.S.
For the public, no other international concern comes close to posing the same level of threat as ISIS. Ranking second on the global threats list is Iran’s nuclear program: 62% say this is a major threat to the well-being of the U.S. – 21 points fewer than say the same about ISIS. And while major concern over ISIS is up 16 points from August 2014, no other concern has seen a significant rise in the share viewing it as a major threat to the U.S. since the summer of 2014. The survey, which was in the field during the UN climate change conference in Paris, finds 49% say global climate change is a major threat to the U.S., little different than the 48% who said this in August 2014. Concern over Russia has slipped since August 2014. Last summer, 53% viewed growing tension between Russia and its neighbors as a major threat to the U.S. In the current survey, fewer (42%) say growing authoritarianism in Russia is a major threat. There continue to be wide partisan differences in views of the top international concerns for the U.S. Overall, Republicans are more likely than Democrats to see each of these issues as a major threat to the well-being of the U.S.—with the notable exception of climate change. 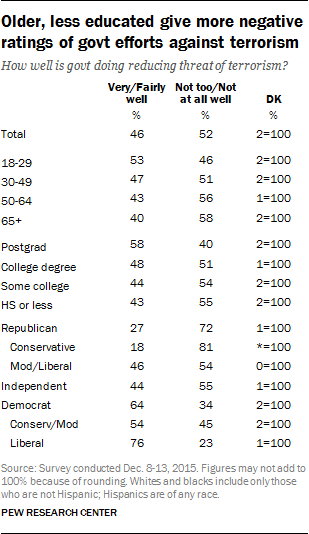 Fully 93% of Republicans view ISIS as a major threat compared with 79% of Democrats and independents. Since August 2014, concern over ISIS has risen about equally across the political spectrum and the partisan gap is no larger today than it was then. 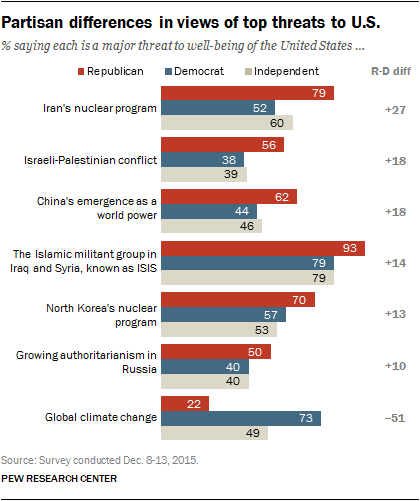 Republicans are also more likely than Democrats and independents to view Iran’s nuclear program, the conflict between the Israelis and the Palestinians, China’s emergence as a world power, North Korea’s nuclear program and growing authoritarianism in Russia as major threats to the U.S.
By contrast, on the issue of global climate change, far more Democrats (73%) than independents (49%) or Republicans (22%) view this as a major threat to the U.S. The 51-point gap in the share of Democrats and Republicans who view global climate change as a major threat is as large a gap measured since Pew Research began asking the question in the fall of 2009. The recent attacks in Paris, France and San Bernardino, Calif. have not led to a fundamental shift in how the public views the U.S. military campaign against Islamic militants in Iraq and Syria. Overall, a 64%-majority continues to say they approve of the U.S. military campaign against Islamic militants in Iraq and Syria, while just 28% say they disapprove. 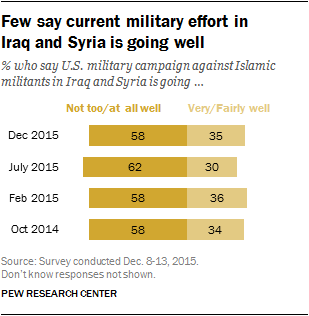 Support for the U.S. military effort has been steady over the course of 2015. Democrats (67%) and Republicans (69%) continue to be about equally likely to approve of the military campaign. Slightly fewer (60%) independents express approval. Current ratings of how well the U.S. military effort against ISIS is going remain negative, but there has been an uptick in the view that the U.S. and its allies will ultimately be successful. About six-in-ten (58%) say the U.S. effort against Islamic militants in Iraq and Syria is going either not too well (39%) or not at all well (19%); 35% say the campaign is going either very (7%) or fairly (28%) well. Views have changed little on this question over the course of the past year, with majorities consistently offering negative assessments of the current state of the campaign. 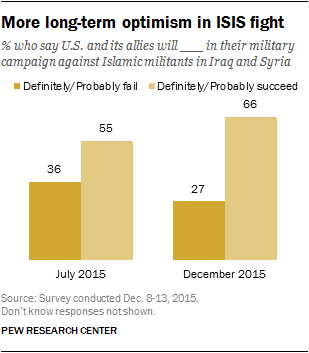 Views are more positive when it comes to whether the U.S. and its allies will succeed or fail in their military campaign against ISIS. Two-thirds (66%) now say they think the U.S. and its allies will either definitely or probably succeed in their campaign against Islamic militants in Iraq and Syria, while just 27% say they will definitely or probably fail. The share who say the U.S. and its allies will succeed is up 11 points from July (from 55%). There are wide partisan divides in current assessments of the campaign against ISIS, but more modest ones in predictions of its ultimate success: 45% of Democrats, compared with 33% of independents and just 26% of Republicans say the campaign is going at least fairly well. Six-in-ten or more Republicans (65%), Democrats (72%) and independents (62%) say it will ultimately be successful. Slightly more now say their greater concern about U.S. military action in Iraq and Syria is that the U.S. will not go far enough in stopping the militants (50%) than go too far getting involved in the situation (42%). However, these views have shown little change from July, when 48% were more concerned about not going far enough and 43% were more concerned about getting too involved in the situation. Three-quarters of Republicans (75%) say their greater concern about military action in Iraq and Syria is that the U.S. will not go far enough in stopping the Islamic militants, while just 18% say their greater concern is that the U.S. will become too involved. By contrast, Democrats (61%) say they are more concerned that the U.S. will go too far getting involved in Iraq and Syria than that the U.S. will not go far enough in stopping the militants there (33%). Conservative Republicans, in particular, express more concern that the U.S. will not go far enough to stop ISIS: 81% say this; only 12% say their greater concern is the U.S. will become too involved. Conversely, two-thirds (67%) of liberal Democrats express more concern that the U.S. will become too involved, while only about a quarter (27%) say their greater concern is that it won’t go far enough. These partisan and ideological divides are slightly more pronounced than they were in July. Concerns over U.S. involvement in Iraq and Syria also differ by age. Adults under the age of 30 express more concern about the U.S. going too far in getting involved in the situation (55%) than not going far enough to stop the Islamic militants (37%). All older age groups say they are more concerned about the U.S. not doing enough to stop Islamic militants in Iraq and Syria than getting too involved in the situation. The public is divided over the question of sending U.S. ground troops to fight Islamic militants in Iraq and Syria: 47% are in favor while an identical percentage is opposed. Views are little different than in July, when 49% were opposed and 44% were in favor of sending U.S. ground troops to Iraq and Syria. Wide partisan divides exist over whether the U.S. should send ground troops. Two-thirds of Republicans (66%) – including 72% of conservative Republicans – say they would favor sending U.S. ground troops to Iraq and Syria, while just 28% are opposed. 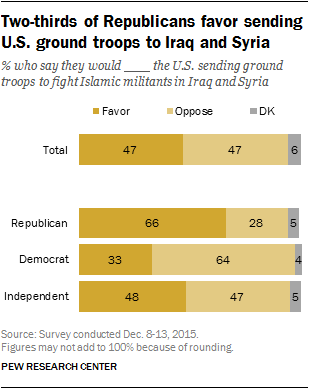 Among Democrats, views are the reverse: 64% oppose sending ground troops to Iraq and Syria, 33% are in favor. Among independents, about as many favor (48%) as oppose (47%) the use of U.S. ground forces to fight Islamic militants in Iraq and Syria. Views among partisan groups are little different than they were in July 2015. These attitudes are little changed from earlier this year, but the balance of opinion has shifted since early 2014, before ISIS registered as a major threat for the public. 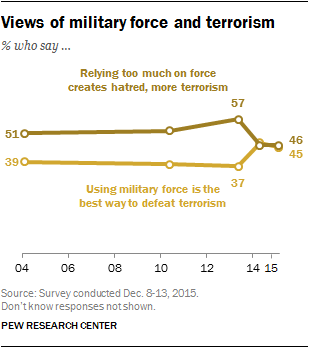 In March 2014, more said relying too much on force creates hatred (57%), compared with 37% who say overwhelming military force was the best way to defeat terrorism. Views were similar to those in 2014 when the question was previously asked in 2011 and 2004. 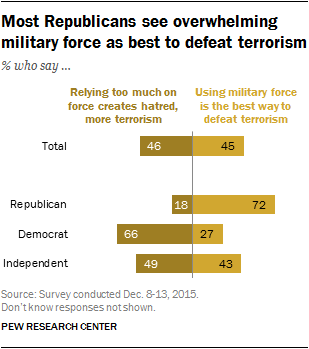 There are wide partisan differences on the question of force and global terrorism. Democrats are far more likely to say relying too much on force creates hatred that leads to more terrorism than to say using overwhelming military force is the best way to defeat terrorism around the world (66%-27%). By contrast, Republicans are more likely to see overwhelming force as the best way to defeat terrorism by a 72%-18% margin. Independents are more divided: 49% say relying too much on force creates hatred, while 43% say overwhelming military force is the best way to defeat terrorism around the world. Both Republicans’ and independents’ support for overwhelming military force as the best way to defeat terrorism rose sharply in February of this year, compared with surveys over the last decade. Since February 2015, however, partisan views have shown little change. While the public is divided on the wisdom of using overwhelming force to defeat terrorism, most see the U.S. as doing more good than harm when it comes to confronting world problems more generally. Overall, 55% say that problems in the world would be even worse without U.S. involvement, compared with fewer (38%) who say U.S. efforts to solve problems around the world usually end up making things worse. Views on this question are unchanged from March of last year, the first time it was asked by the Pew Research Center. Comparable majorities of both Republicans (62%) and Democrats (56%) say world problems would be worse without U.S. involvement. But there is an ideological divide on this question within the Democratic Party. By two to one (62%-31%) more conservative and moderate Democrats say problems in the world would be worse without U.S. efforts. 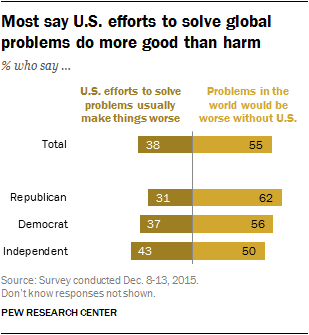 Among liberal Democrats, about as many say U.S. efforts to solve problems usually end up making things worse (45%) as say problems in the world would be even worse without U.S. involvement (50%). 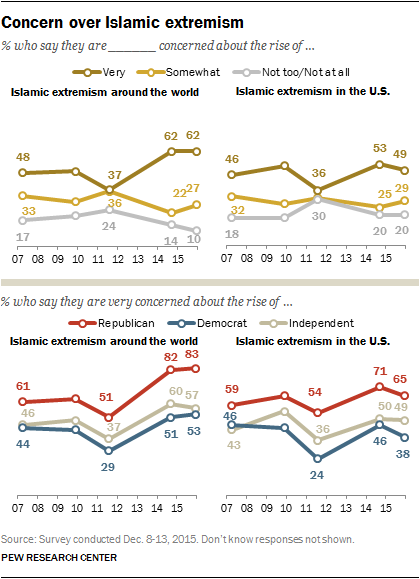 Overall, the public continues to worry about Islamic extremism around the world and in the U.S. About six-in-ten (62%) say they are very concerned about the rise of Islamic extremism around the world, and just about half (49%) say the same about the possible rise of Islamic extremism in the U.S. Comparable percentages said they were very concerned about the rise of Islamic extremism in September of last year. These are among the highest levels of concerns measured in the questions’ trend dating to 2007. Republicans remain more likely than Democrats to say they are very concerned with Islamic extremism around the world (83% vs. 53%) and at home (65% vs. 38%). The public continues to have divided views of Barack Obama’s job performance: 46% approve and 49% disapprove of the way he is handling his job as president. His overall rating is little changed over the course of 2015. Obama’s ratings for handling the economy (43% approve) and immigration policy (37% approve) are more negative than positive. He receives mixed ratings for his handling of global climate change (45% approve, 40% disapprove) and race relations (44% approve, 47% disapprove). And for the first time in his presidency, more Americans say they disapprove of the way Obama is handling the threat of terrorism (57%) than approve (37%). Over the course of his first term, the public generally gave Obama positive marks for his handling of the threat of terrorism, peaking at 69% approval in May 2011 following the killing of Osama bin Laden. But his ratings were divided earlier this year (46% approval in May) and now are in negative territory. 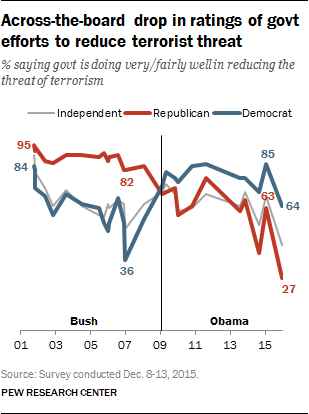 Views of Obama’s handling of the threat of terrorism have always been strongly associated with partisanship. And his ratings have dropped across all partisan groups. Today, Democrats continue to largely approve of Obama’s handling of the terrorist threat, though to a lesser extent than earlier in his presidency. Nearly two-thirds (64%) of Democrats now say they approve, while 29% disapprove. In May, 72% of Democrats approved of his handling of the terrorist threat. Only 11% of Republicans approve of Obama’s handling of the threat posed by terrorism while nearly nine-in-ten (87%) disapprove. Approval on this issue among independents has also reached a historical low. Only a third of independents (33%) now approve of the way Obama is handling the threat of terrorism; roughly six-in-ten (61%) offer a negative appraisal. 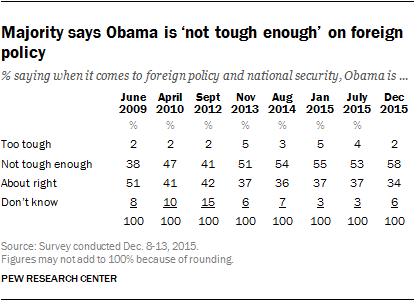 The public has long been more likely to say Barack Obama is “not tough enough” on foreign policy and national security (58% currently) than say his approach is “about right” (34%) or “too tough” (just 2%). The share now saying Obama is not tough enough is up five percentage points from July (53%), though little different from views at the beginning of the year (55%). 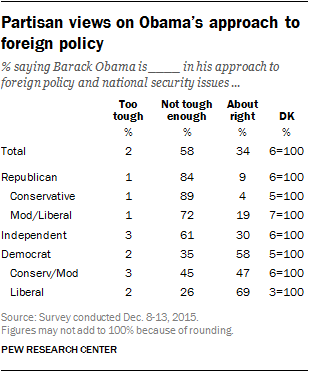 Fully 84% of Republicans say Obama’s approach to foreign policy is not tough enough. A 61% majority of independents say the same (30% say it is about right). Most Democrats (58%) view Obama’s approach as about right, while 35% say it is not tough enough (just 2% say it is too tough). Among conservative and moderate Democrats, 45% say Obama is not tough enough, compared with just 26% of liberal Democrats.